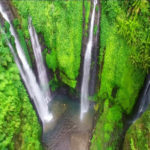 Reviewing about tourism on the Bali Island is endless The Bali Island is most famous for its beauty on the world stage. But it is unfortunate because most of the explored travelers are mostly only tourists that are only going to the beach. Whereas the island of Bali also has a lot of tourist destinations in the mountainous area. One of them is Sekumpul Waterfall, located in the north of Bali. 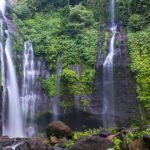 The location of Sekumpul Waterfall is in the Sekumpul village, Sawan district, Buleleng regency. There is a waterfall in the midst of a lot of trees in the hill area. The name Sekumpul means “Kumpulan” or Set. This is because there is more than 1 waterfall there, and based on the information there are 7 waterfalls not too far away from each other. The height of this waterfall is around 100 meter. Sekumpul Waterfall also well- known as Gerombong Waterfall. This is not the only one waterfall that drains water. However, two waterfalls are flowing swiftly. We can enjoy the waterfalls from a distance before we enter the waterfall area because of the height. There are two fallen waterfalls and the source of a waterfall covered by green trees that cover the surface of the hill. These waterfalls have a different character and source. The first waterfall has a single flowing waterfall. Such other waterfalls are often encountered and come from a mountain spring. And the second waterfall is higher than the first waterfall, has a waterfall shape that dangles like a mosquito net and comes from the stream of a river. So during the rainy season, the first waterfalls remain in a clear state, while the second waterfall will be brown turbid. Before you can enjoy the waterfall up close, visitors will be invited to travel on foot after the entrance. Passing through several concrete steps and a handle of iron. This makes the visitors feel safe to descend the hills. When going down the stairs you can hear the sound of a thundering waterfall hitting the pond of water under it. Once down the stairs, there is a bridge with a clear river water below it. Soft tracking shortly after passing the bridge through a small forest and then you get to the Sekumpul Waterfall.